Water Pump & Timing Belt Kit. 5/ 2011 - / 2016. 3/ 2011 - / 2017. 5/ 2011 - / 2017. 9/ 2009 - / 2015. 12/ 2010 - / 2017. 10/ 2007 - / 2017. 10/ 2005 - / 2010. 3/ 2001 - / 2016. Petrol: 1.2, 1.4. 10/ 2009 - / 2017. 7/ 2008 - / 2016. LPG: 1.2, 1.4. 10/ 2005 - / 2016. 199A4.000, 350A1.000, 199A7.000. 9/ 2010 - / 2017. 4/ 2008 - / 2017. 3/ 2009 - / 2011. 3/ 2009 - / 2017. 10/ 2005 - / 2017. 6/ 2007 - / 2017. 1/ 2007 - / 2009. Bi-Fuel: 1.2, 1.4. 4/ 2009 - / 2016. 9/ 2003 - / 2016. 188A4.000, 169A4.000, 169A4.000. 4/ 2009 - / 2017. 6/ 2012 - / 2017. 2/ 2012 - / 2017. 10/ 2009 - 2/ 2012. 6/ 2009 - 2/ 2012. 7/ 2009 - 2/ 2012. 169A4.000, 199A4.000, 199A7.000, 350A1.000. 8/ 2003 - / 2012. 9/ 1999 - / 2012. 2/ 2000 - 10/ 2009. 3/ 2012 - / 2017. 169A4.000, 199B9.000, 350A1.000. 1/ 2007 - 12/ 2009. 11/ 2007 - / 2017. 10/ 2008 - / 2017. 11/ 2010 - / 2012. 9/ 2005 - / 2012. 11/ 2010 - 12/ 2011. 10/ 2003 - 12/ 2011. 188A4.000, 169A4.000, 350A1.000. The table above is just a guide and there may be choice options on some models. 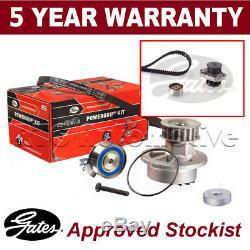 Kit Components: 1x PowerGrip Belt 5627XS, 1x Tensioner Pulley T43156, 1x Water Pump WP0069, 1x Installation instructions I-1121. This item is equivalent to the following part numbers: GATES: 5627XS, GATES: T43156, GATES: WP0069, ALFA ROMEO: 71771599, FIAT: 71771599, FIAT: 71776007, CONTITECH: CT1115WP1, DAYCO: KTBWP4662, FAI AutoParts: DTTWDFAI, FEBI BILSTEIN: 45100, INA: 530 0462 30, RUVILLE: 56015701, SKF: VKMC 02206, SKF: VKMC 02206-2, TRISCAN: 8647 100019. Their highly engineered products are critical components used in diverse industrial and automotive applications where the cost of failure is very high relative to the cost of our products. Gates products sell globally under the Gates brand, which is recognized by distributors, original equipment manufacturers, and installers as the premium brand for quality and technological innovation, a reputation built for over a century since being founded in 1911. If a part is faulty a replacement will be sent out after the return and testing of the old unit. Labour claims & consequential loss claims are never accepted. 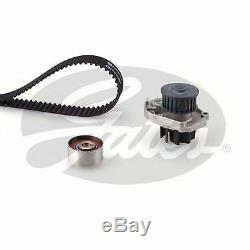 The item "Gates Timing Cam Belt Water Pump Kit For Alfa Chrysler Fiat Ford KP15627XS" is in sale since Wednesday, July 19, 2017. This item is in the category "Vehicle Parts & Accessories\Car Parts\Engines & Engine Parts\Belt, Pulley & Tensioner Kits". The seller is "rtgroup11" and is located in PR25 3US.